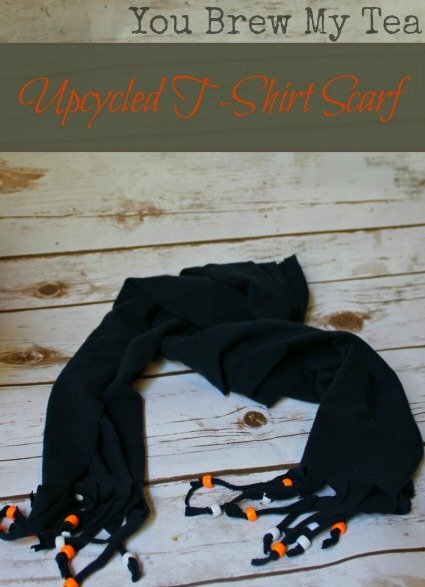 This practically free upcycled t-shirt scarf idea is a snap to make. I find it infinitely satisfying not only to my wallet but to my creative soul to create something from an item that would be otherwise cast aside. I love to tear apart thrift store finds, outgrown clothes, and re-purpose scraps…you know, just for fun. This fun and simple scarf was no exception. Quickly put together from a discarded t-shirt of my husbands and some pony beads from the craft stash. I love a DIY- that can be customized to your favorite colors or to suit the way you dress- this one is an homage to my favorite fall team- the Denver Bronco’s, but can easily be created to represent any team. 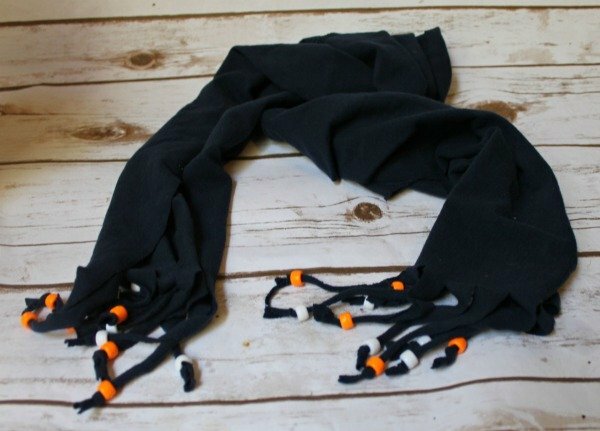 I love the fact that this Denver Broncos DIY Upcycled T-Shirt Scarf also makes a sweet and simple handmade gift for friends and family too, so little is homemade with care anymore that they are usually treasured. Cut the bottom of t-shirt straight across, right above the hem. 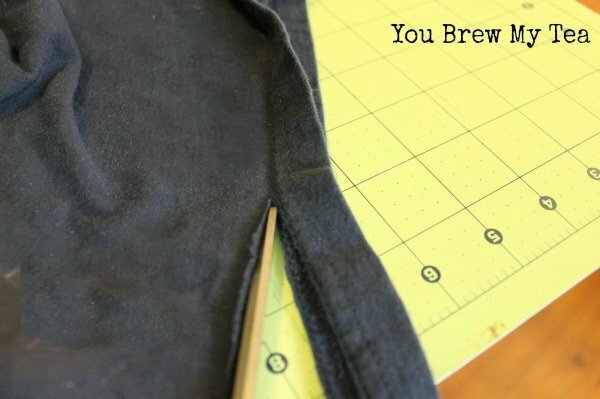 Then cut the bottom of shirt off so that it is 6- 8″ wide, leaving you with a band, cut one end on the inside of seam. 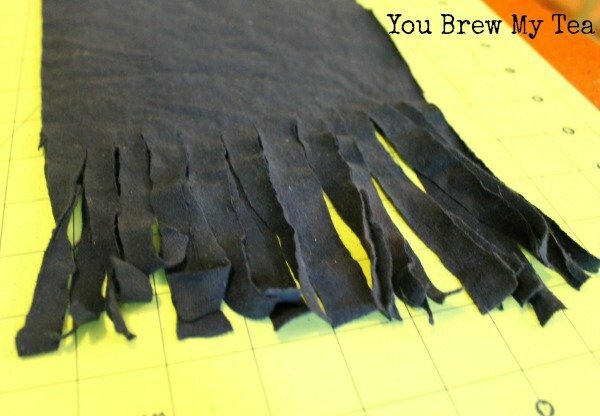 On the unattached ends cut strips 1/4 ” wide from end up 6″ creating a fringe. 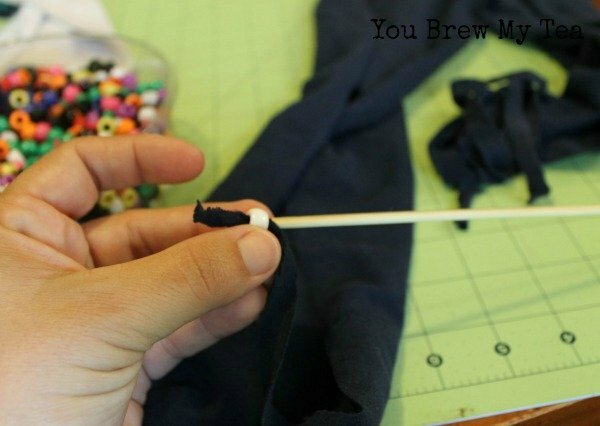 Choose your bead colors, using a skewer push the end of each fringe through the center of a pony bead, and tie a knot at the very end of the fringe. Continue all the way across until finished. Your scarf is ready to wear, you can wash on a gentle cycle but i recommend hand wash and hang up to dry for best care. 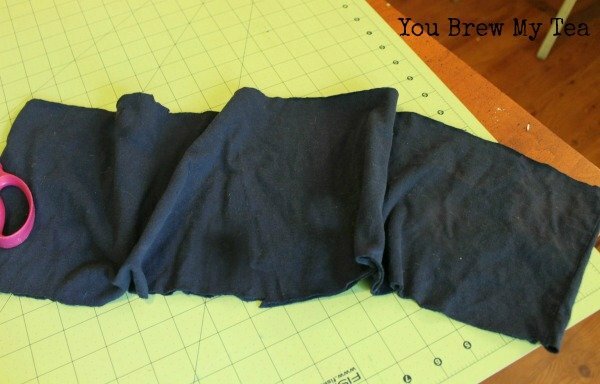 As you can see this diy upcycled t-shirt scarf is great for an easy afternoon craft with the kids too! I love the fact that it is great for me, but doing it in team colors means I could probably gift to the men in my life too! 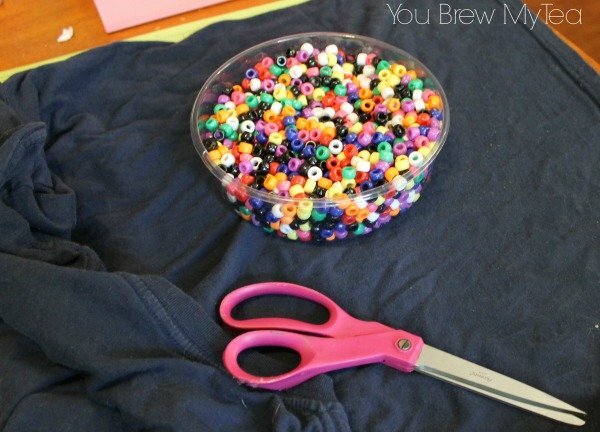 Gather up your old t-shirts and beads to have an afternoon of fun diy scarf making with the kids! Cute scarf! I love the beads on the ends! Great idea! BRILLIANT! I love the idea of adding the coloured beads to match a sporting team! Pinning this one! What a lovely fun simple idea. Great twist on the T-shirt scarf. hadn’t thought to add beads! brilliant! Cute! Upcycling projects are my favorite. It’s so amazing to see things so completely transformed. Thank you for linking at the In and Out of the Kitchen Link Party. Hope to see you again next week.